Open index.html in your editor and use HTML to create the page your client has requested (below) using the HTML elements you have been taught (and maybe some fo the new ones listed at the bottom of the page). an h2 subheading saying Who are we? 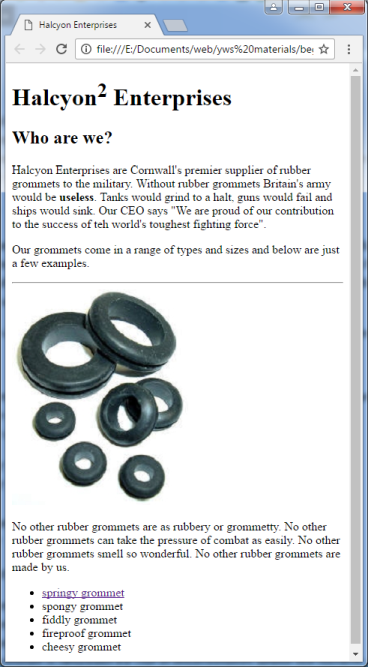 Halcyon Enterprises are Cornwall's premier supplier of rubber grommets to the military. Without rubber grommets Britain's army would be useless. Tanks would grind to a halt, guns would fail and ships would sink. Our CEO says "We are proud of our contribution to the success of the world's toughest fighting force". Our grommets come in a range of types and sizes and below are just a few examples. 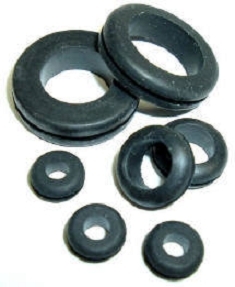 No other rubber grommets are as rubbery or grommetty. No other rubber grommets can take the pressure of combat as easily. No other rubber grommets smell so wonderful. No other rubber grommets are made by us.